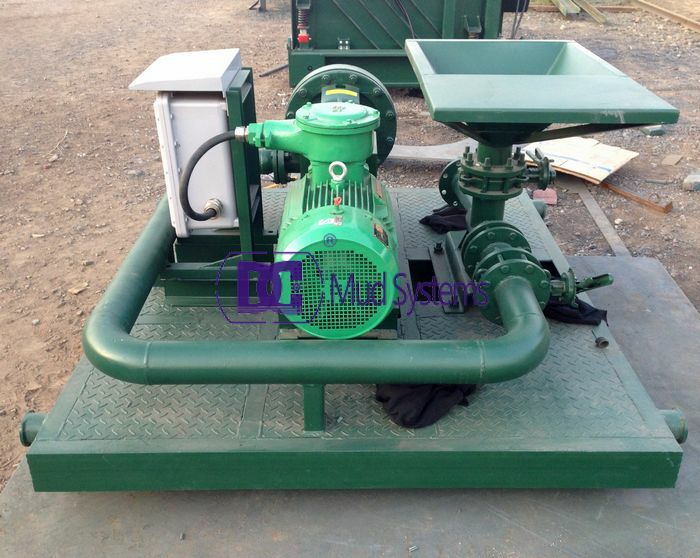 Jet mud mixer is a unit combination of centrifugal pump, mud hopper and manifold valve. 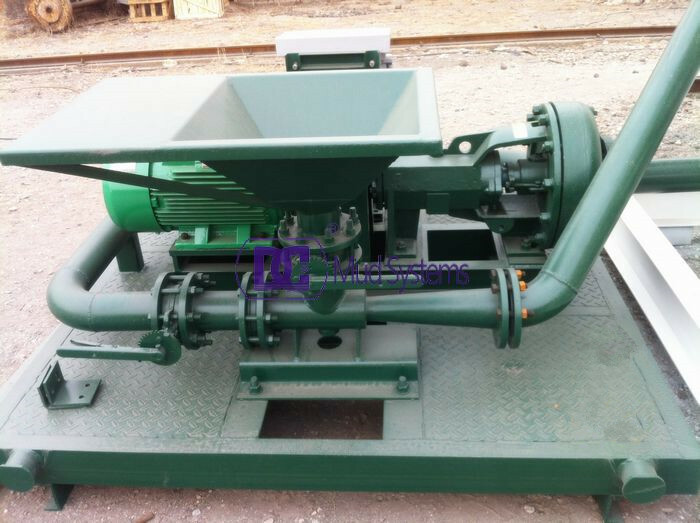 Jet mud mixer is used to change the fluid or mud density, viscosity by adding and mixing bentonite. 2. Electric components: The well-known brands as Siemens, Schneider or ABB. 4. Painting: Anti-rust treatment: Galvanizing treatment for the base, hopper and the pipes. 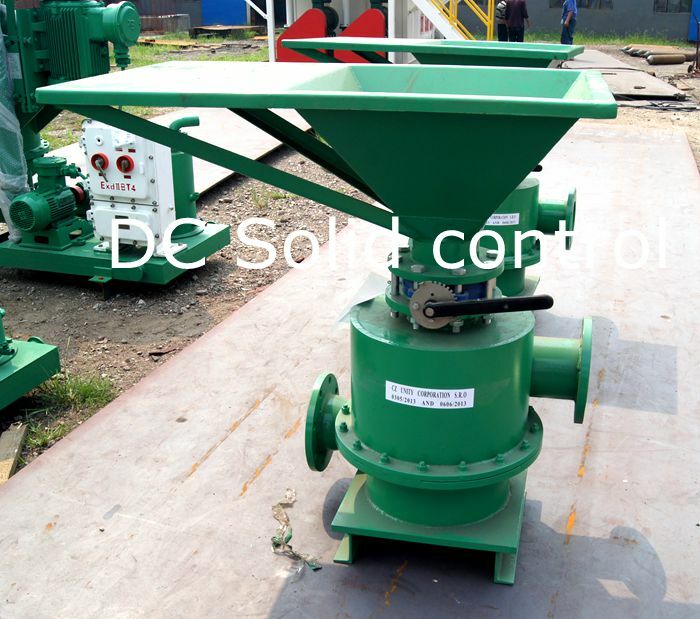 DCSLH series jet mud mixer is matched with other drilling solids control system. It’s safe and reliable, and easy to move. It can enhance dispersion effect of material, improve pressure head of mixed liquid, make the material recycle and mix enough in the mud tank. Jet Mud mixer is special equipment to prepare and increase the drilling fluids weight by adding and mixing bentonite, change the fluid density, change the mud density, viscosity, and dehydration. The effect is more prominent matching with Shear Pump. Below is the production picture of the Jet mud mixer for a foreign client who are mainly focus horziontal directioanl drilling. The unit includes one sand pump, one jet mixing hopper and one jet mixer that are installed in a base with pipe valves. It is safe and stable and can be moved conveniently. 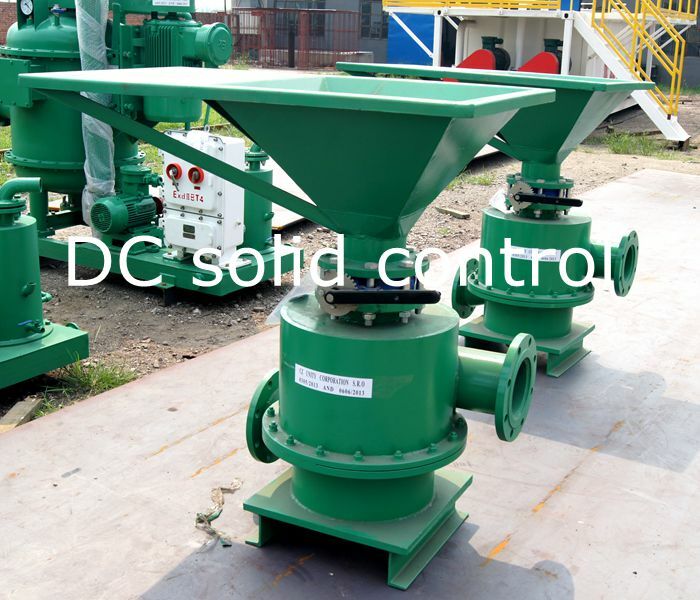 At the same time，DC Solid control can make Twin-Jet Mud Mixer according to the user requirements.It is designed by DC solids control bentonite mud mixer,drilling mud tank jet mixer. 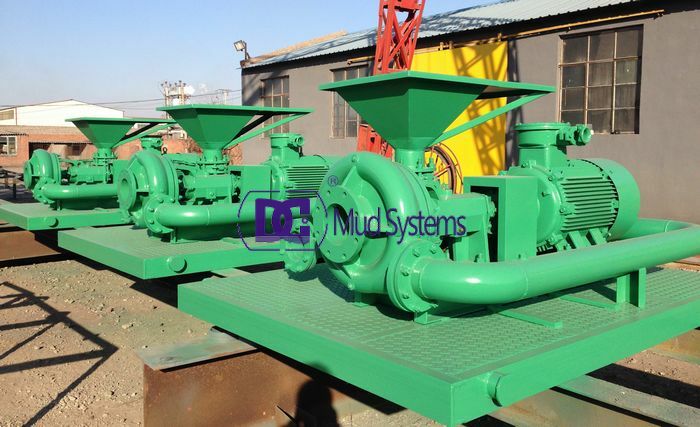 DCSLH series compact structure jet mud mixer connected by manifold valve, jet mud mixer is composed of sand pump, jet hopper and mixer. Four models of jet mud mixers are available as below. Jereh can provide jet mud mixer as per customer requirements. 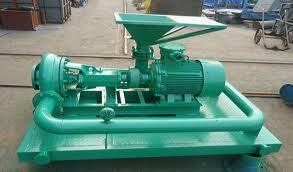 Mud-flow device, also called a jet hopper, Mud hopper is an accessories part of drilling fluid circulation system. Meanwhile mud hopper is an important part in jet mud mixer for increasing the liquid in the tube shear force, improving the dispersion effect. 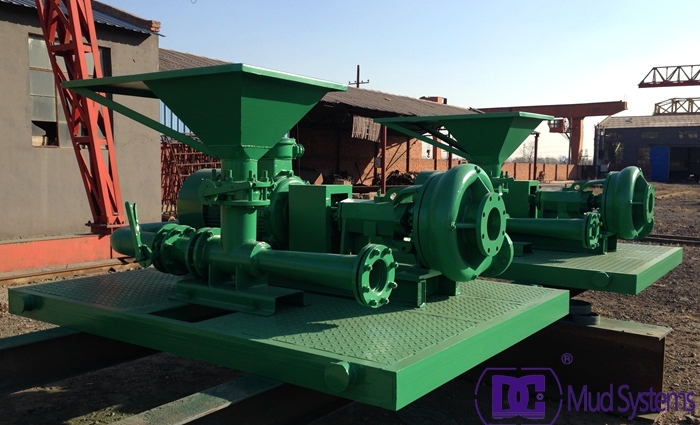 DC Solid control company manufactured 4 sets mud hopper for our repeat Russian clients. The mud hopper is powered by a centrifugal pump that flows the mud at high velocity through a venturi nozzle (jet) below the conical-shaped hopper. Dry materials are added through the mud hopper to provide dispersion, rapid hydration and uniform mixing. Liquids are sometimes fed into the mud by a hose placed in the hopper. DC’S Mud equipmet range of mud mixing hoppers delivers safe, accurate and reliable mud mixing for both on- and off- shore applications. Design of the hopper is focused on key safety and usability features such as dust-free operations, interfacing abilities and remote or manual control options. operations and more modern interfacing abilities. Feeding and dosing is controlled using Open / Close valves; the valves can be controlled remotely (optional) or locally. DC Machinery provides a superior mud mixing and blending system that utilizes its proprietary technologies to mix faster, while delivering complete hydration and a more homogeneous, consistent drilling mud that improves drilling and mud mixing efficiency. 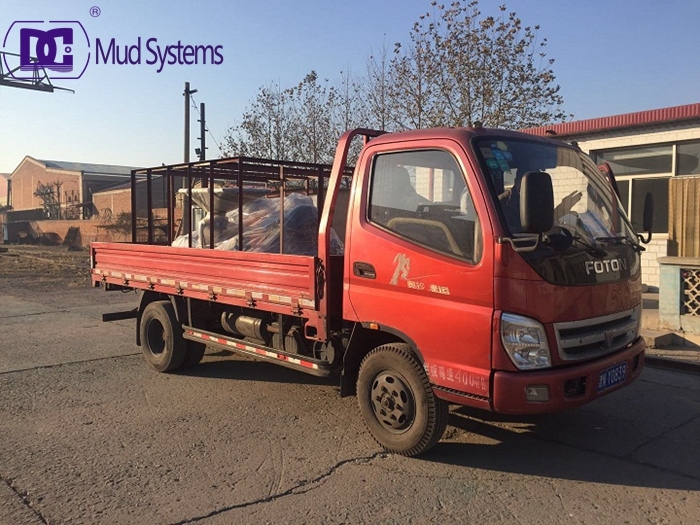 The most important part of mud mixing and bledning system is the drilling fluid jet mud mixer which is used to make and mix drilling fluid to change the density and viscosity. This device can satisfy the fluid weighting and mixing of drilling solids control system for 1500m-9000m drilling. 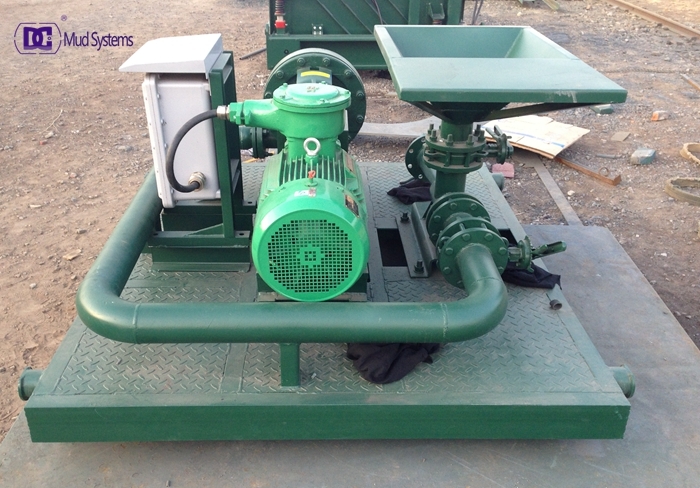 The jet mud mixer consists of one sand pump and one jet mixing funnel which are installed in a base with pipe valves. Double jet mud mixer can be also produced according to your requirements. Our jet mud mixer designed to be the optimal solution for mixing of both mud bulk material and mud additive chemicals into the drilling fluid. The unit has an optional plenum chamber to collect material flow from different sources, such as the surge tank, sack slitting machine and manual sack slitting table. There’re many models of jet mud mixer available. DC Solid control can provide jet mud mixer as per customer’s special requirements. Jet mud mixer is always installed at the end of the complete solids control system, or we could say that it is a unit placed besides the mud tank and used together with the solid control system. It is also can be used with shearing pump, the effect will be more excellent , it can be designed twin jet mud mixer according to customers’ requirements. The drilling flow into the jet pump with certain pressure, in the jet pump fluid spouts out from jet nozzle first, then flows into shear pipe through mixing chamber, Material will be added from hopper to mixing hopper, and move into shear pipe with the flow. During this process, they are dispersed and mixed. The mixture will enter into drilling fluid tank when flows out of the shear pipe. 1. 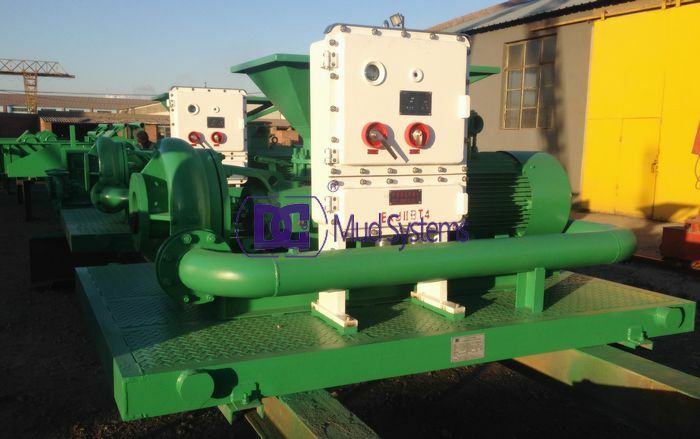 Jet Mud Mixer is a single jet mixer combined with 45 KW ( or 55 KW ) sand pump and a jet mud hopper or a double jet mixer of two pumps and two hoppers. 2. 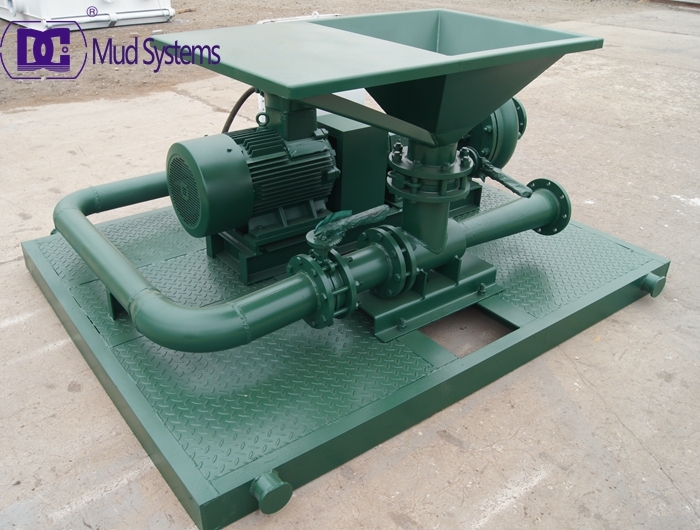 The weighting mud mixing hopper can be combined with a pump or be used independently with pump connected together by manifold valve. 3. Put the drilling fluids materials ( bentonites, barite powder ) and the corresponding chemical additives ( polymer ) into circulation tank. 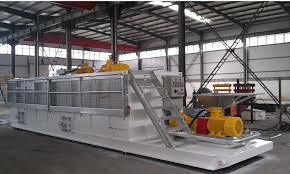 The necessary maintenance can improve the working reliability of the jet mud mixer, and prolong its service life. The work is cleaning the feeding hopper and mixing chamber, keeping the equipment neat. Check the fasteners once a month, be sure they are tightening. DC’s new Jet mud mixer specializes in simple structure and easy manipulation which can satisfy the drilling fluid’s need on weighting and compounding from 1500m to 9000m depth. 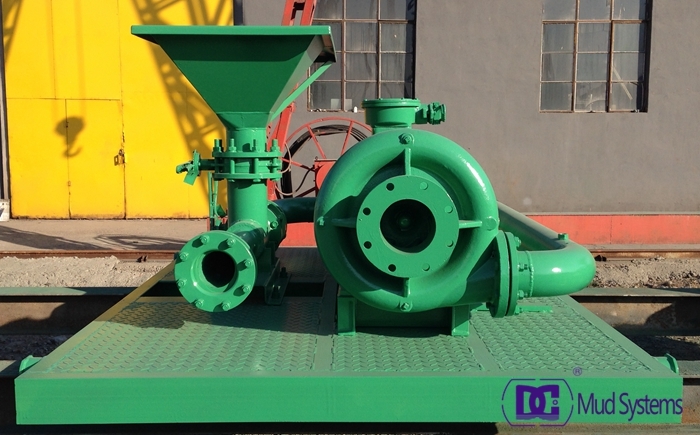 DC’s jet mud mixer can be customized to be double jet mud mixer based on customer’s need. Welcome to inquiry DC advanced Jet Mud Mixer. 1. Select jet mud mixer that suitable to drilling fluid solid control system. Normally, to most solid control system, a mixing hopper is just enough, if the drilling fluid circulation rate is bigger than 4550L/min, consider using a capacity of 4550L/min mixing hopper. 2. Keep the distance of line pipes and mixing hopper as short and straight as possible. Selection of pump and motor should based on the system requirements of pressure head and flow rate. During all operation, Venturi tube can play a good role, especially when the system back pressure will reduce the drilling fluid mixing hopper working efficiency, venturi tube allows fluid to move to higher height than the hopper in the vertical direction, in many cases, mixing hopper is placed in horizontal direction, while the downstream pipeline is placed higher or equal to the height of the drilling fluid tank top. Drilling jet mud mixer is the device integrated with venturi hopper and mechanical seal jet mixing pump which are connected with manifold valve. Featuring simple structure and high practicability, it can work reliably and be moved conveniently. The device is mainly used for preparing and weighting drilling fluid through changing the density, viscosity and the condition of dehydration of the drilling fluid. 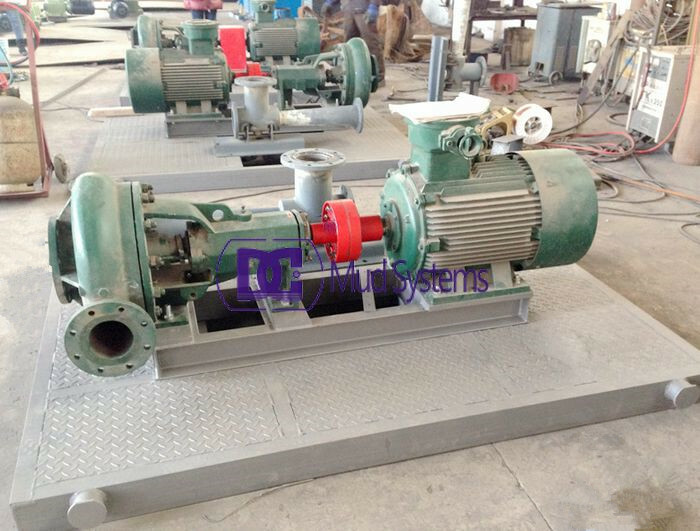 If working with mud shear pump, it can show much greater performance. 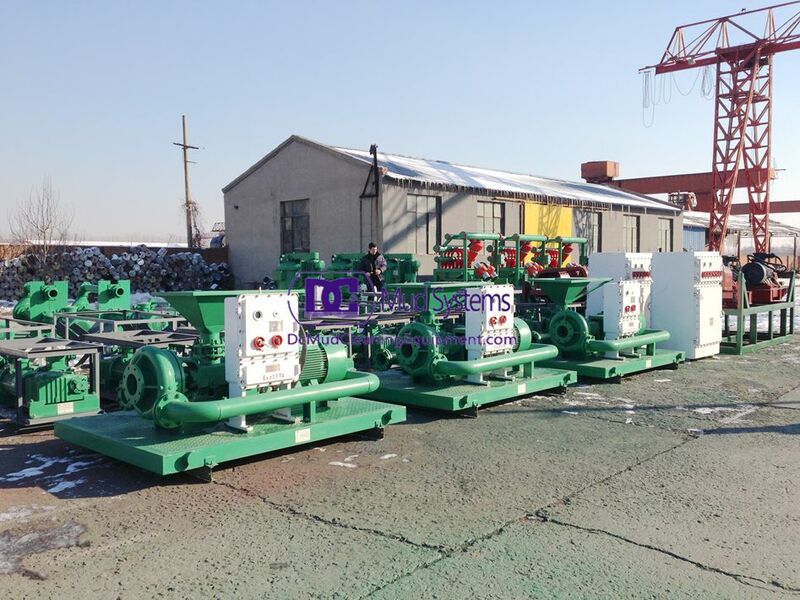 The device can also be designed to be a double jet mixing device to meet the needs of drilling. The drilling mud mixer can help operators to get the ideal drilling fluid with good properties by adding bentonite, polymer and other powder additives. As to the application of weighting the mud, the ability of mud mixer to handle barite plays an even more important role. 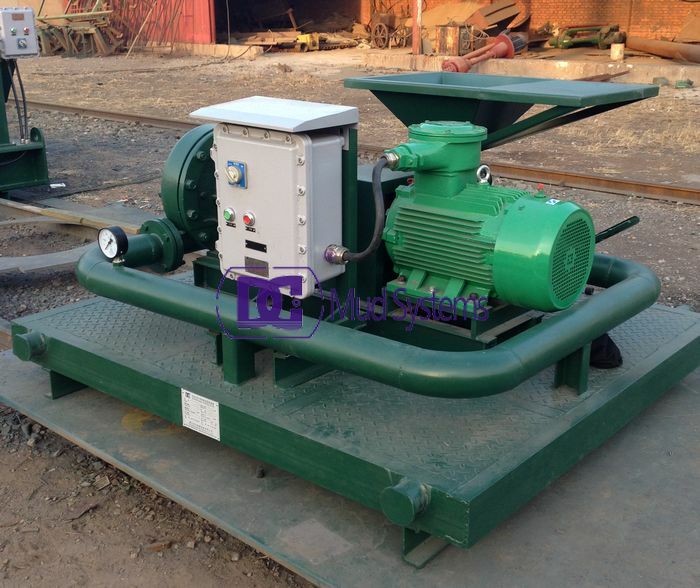 Meanwhile, the jet mixing pump and the hopper can be installed flexibly on a single skid, or on the skid at tank end or separately with the hopper on tank top and the pump at tank side. The flexible design can make the whole mud system compact and user friendly.